Climate Change Out My Window -- And Yours? 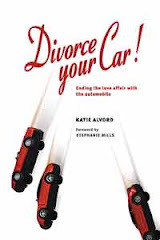 Nearly ten years ago now, I signed a contract to write Divorce Your Car! Even then, as I researched that book, delving deeply into topics like worsening U.S. fuel efficiency, China’s burgeoning car boom, and of course, global warming, there were times I felt as if I were watching the climate change right outside my own window. Now it turns out that, in the winter of ‘97-98, I probably really was watching the climate change. So were all of us. Climatologists rightly say that one season doesn’t make a trend, and that particular winter’s warmth -- while well out of the norm -- doesn’t prove a thing about climate change when taken in isolation. But in recent reading, I’ve learned there is a climatologist, Julia Cole at University of Arizona, who considers 1998 a “magic gate” -- defined in Tim Flannery’s book The Weather Makers as a kind of leap made by the climate, marking “the onset of remarkable phenomena.” That year also marked the beginning of a trend toward much lower lake levels in the Great Lakes, including Lake Superior. These changes have happened more quickly than anyone had expected. Earlier this year, researchers at University of Minnesota, Duluth -- whose Large Lakes Observatory sits about 250 miles west of my house -- looked back over data from the last 25 years or so and found that not only have regional temperatures been warming faster than the global average, but surface waters in Lake Superior have warmed at twice that rate. Surprisingly fast, the researchers said. An article I wrote about this is online here. So I guess Lake Superior is still like the Arctic: both places are now warming quickly. Since 1998, the Lake Superior basin has had more balmy low-snow winters. This past January our local Chamber of Commerce came close to applying for economic disaster area designation, because the businesses built around snow sports were suffering. That same month, a cross-country ski tournament held near here had to truck in snow to make racing trails. I no longer hear much talk about “when winter gets back to normal.” Now, everyone is wondering about the lake levels, which are near record lows and low enough to be costing real money for shippers, marinas, and municipal water systems. Are lake levels low due to drought conditions that will end soon, or is the drought part of a long-term shift to a dryer climate here -- a shift that could drop Superior’s level even further? Not everyone around here believes in “Al Gore’s global warming,” but there seems to be a sort of quiet waiting going on, a watching to see what’s going to happen next. Lake Superior is the cleanest and most wild of all the Great Lakes. Its shoreline is less than a mile from our front door. We walk the wooded trails to that sandy, rocky shore several times a week. We see how the lake affects our weather and the way we feel. We don’t yet know exactly what the rapid temperature rise means for our lives, and the lives of all the many occupants of this forested waterfront -- from black bears to tiny mice, ancient cedars to delicate ferns. What I do know is that the rapid change means there are more reasons than ever for all of us to change our relationship with driving. The carbon dioxide coming out of our tailpipes, and from all of our fossil-fuel burning, appears to be changing the climate faster than we’ve expected even with our sophisticated models, perhaps faster than we will be able to handle it. How much worse it gets depends in part on our actions, and one action we can control more than many of us believe is how much we drive. There are so many ways to cut back on driving that I wrote 120 pages about them! See more about this. Here’s one way of reducing your driving, based on an idea from Ellen Santasiero of Bend, Oregon. Get out a map, draw a circle around your house with a radius of one-half mile, then commit to walking or cycling any time you take a trip within that circle. Every week, expand the circle by another half-mile until you feel you’ve reached your limit. If you do this, you’ll not only cut greenhouse gas emissions, you’ll also live longer -- lots of research supports this link between more walking or cycling and longer life. I’m guessing there’s a natural area near you that may already be showing evidence of our changing climate. Maybe this is happening in some of your favorite places. Do you know of climate-related shifts already occurring in places near you? Let me know with a post to this blog.